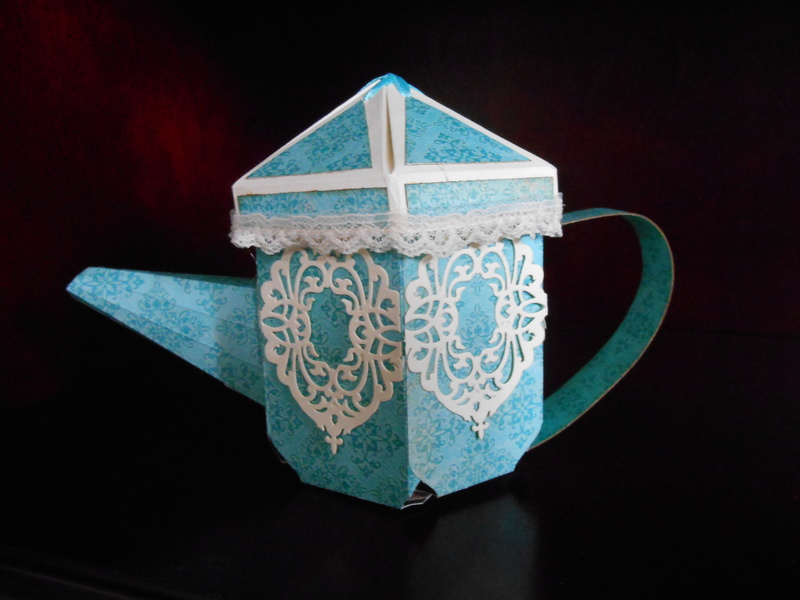 This tea pot is an advanced project but worth it. I made these for all of the women in my family as Valentines and filled them with chocolates. I used different papers for each person based on their style. I forgot to take pictures along the way because I was having so much fun. I will make another one and add the photos. If you would like to recreate this project, see below. Stamp all flowers and leaves onto desired paper. For this project, I stamped my flowers and leaves on the Arianna Blooms paper. Die cut all flower pieces and leaves. Color your flowers and leaves. Since I used patterned paper, I only accented the flower petals with Walnut distress ink and Wink of Stella Gold. Use flower-shaping kit to shape petals and leaves. Assemble your flowers and add your centers. I used Golden Sun ink to color my stamens. Cut your card stock to measure 10 ¾” x 7”. 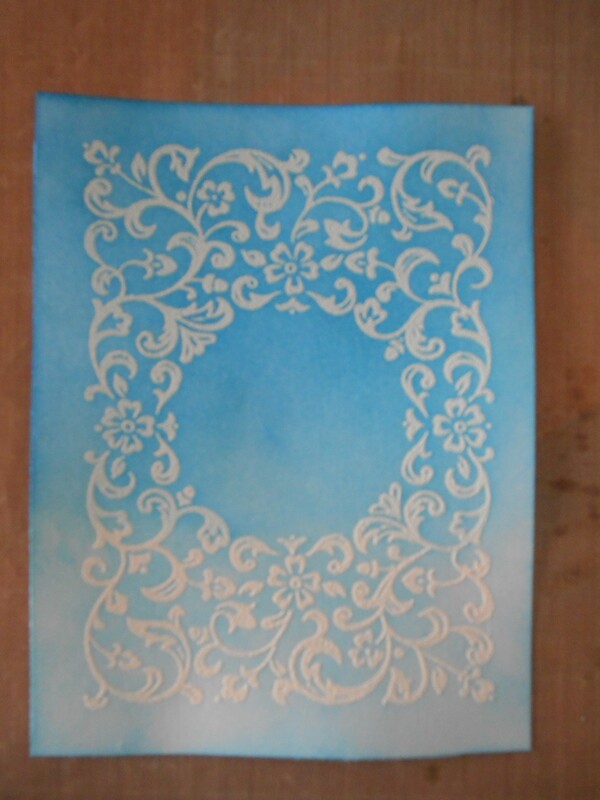 I used a patterned paper, so make sure you cut your paper the direction you would like your pattern to be seen. On the long side of the paper, score at 1 ¾”, 3 ½”, 5 ¼”, 7”, 8 ¾”, 10 ½”. On the short side of your paper, score at 1 ¼” and 4 ½”. Using your Envelope Punch Board, punch along the 1 ¼” score line at each of the long side score lines. Fold over the paper at each long score mark and then punch. Fold the next score line and punch again. Do this for all of the score lines. Cut off top right and bottom right squares. Apply double-sided tape to top edge of paper. Fold down along the 4 ½” score line and attach. Apply double-sided tape to little flap on the right side. Bring the edges together into a circular shape, tuck the little flap in and attach. To close the bottom of the cup, apply double-sided tape to the edge of a flap and then attach to the piece opposite the opening. Do this with other opposing pieces. Cut your card stock to 3” x 5 ¾”. On the short side of your paper, score at 5/8”. Fold score line down. With the folded end against the edge of your score board, notch at ½”, 1”, 1 ½”, 2”, 2 ½”, 3 ¼”, 4 ¼”, 4 ¾”, 5 ¼”. On the long side of the paper opposite your notches, make another notch at 2 7/8”. Using your 2mm tip from your flower shaping kit and a ruler, score a line from the center notch to the 2 middle notches below. Move the top of the ruler slightly over and then score to the next notch. Do this to all the notches. Fold all of the score lines gently. Cut the far left and far right of the paper off at the edge of the last score line. From the bottom, cut up to the score line at the point of each notch. 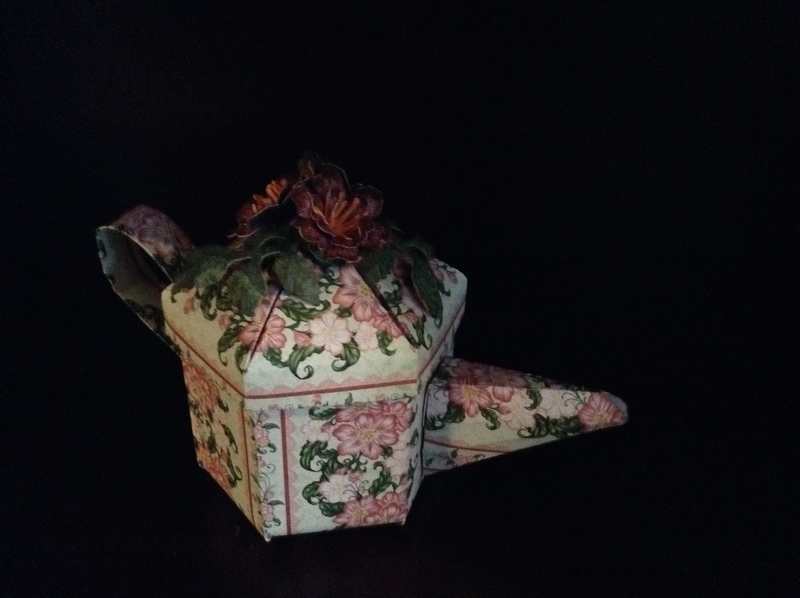 Apply double-sided tape to the right edge and fold over to create spout shape. Marry the sides together to give a clean edge. Close the bottom of the spout the same way that you closed the bottom of the mug. Snip the tip of the spout at an angle from the top down. Set aside. We don’t want to attach the spout to the base until we know where our lid is going to rest. Cut your card stock to measure 11 ¾” x 2 7/8”. On the long side, score at 1 7/8”, 3 ¾”, 5 5/8”, 7 ½”, 9 3/8”, 11 ¼”. On the short side, score at ½” and 1”. Flip paper over so that short side is on the left. Notch each square in the middle: 1 ½”, 3 3/8”, 5 ¼”, 7 1/8”, 9”, 10 7/8”. Turn paper back over. Using your ruler and 2mm tip again, gently score from the center of each square to the corners creating a central triangle. Fold your vertical score lines as valley folds. Fold your diagonal score lines as mountain folds. Apply double-sided tape on the back side at the bottom edge (edge near the ½” score line). Fold over and attach. Apply double-sided tape to the front right edge of your paper. Make a circle shape with your paper and marry the edges. You should be able now to bring all of the triangle points together toward the center and see the shape of the lid. In the center of each triangle near the tip (leave a little room so your paper won’t tear), punch a small hole. Taking your ribbon, come up through a hole from the bottom. Go down the hole opposite from where you came up. Even out your tails. They should be hanging from the inside of your lid. With 1 tail, come up thru a hole that is on the opposite side from your original spot. Then, go down into the hole that is on the opposite side. Repeat this with the other tail. Gently tighten your ribbon until all the tips of the triangles come together. Tie a knot in your ribbon on the inside of your lid. Decorate your lid with your beautiful Arianna Blooms and foliage. Place your lid onto the base. Using adhesive, attach your spout to the front of the base. For your handle, use a 1 ¼” x 6” piece of card stock. Score at ¾”, fold in half and adhere together. With your fingers or a bone folder, gently give a curve to the handle. Score the handle edges at ½” on each side and fold. Apply adhesive to each scored area. Attach the handle to the side of the base and to the bottom of the base. Manipulate curve of the handle into desired shape. Here are some other colors. I always have some one in mind when I create something. This Valentine basket was inspired by my niece. She loves purses and all things girly. 2 – 12″ x 12″ card stock. I used a double sided paper that is pretty thick but not quite 110#. (If you don’t use double sided paper, use the second piece of paper or a coordinating paper to line the inside of the basket). Leave 1 sheet as a 12″ x 12″. The second sheet, cut 12 strips measuring 1″ x 4 1/4″ (side of box) and 2 strips measuring 1″ x 12″ (handle). 1 – white 12″ x 12″ card stock. Cut 12 strips measuring 1 1/4″ x 4 3/8″ (side of box) and 1 strip measuring 1 1/4″ x 12″ (handle). Score pal, adhesives (wet & dry), ink for edges, lace, ribbon, flowers, brads, crocodile or pokey tool, I used silver jewel border Dazzles for the handle, beads. Take your 12″ x 12″ paper and score at 4″ and 8″on the back side of the paper. Rotate your paper 90 degrees and score again at 4″ and 8″. Fold all score lines. Next, cut the bottom left score line on each side 4″(cut up to the score line then stop, rotate and repeat). Please see photo before cutting so you know what I mean. This is the inside of my box. Next, take your decorative strips and your white strips and ink the edges. I used a pink ink to match my card stock. Then mount the decorative strips onto the white strips. For an extra sassy look, you can use a thin border punch to detail the edges of the white strips. I find it easier to mount the strips onto the box frame now compared to when the box is put together. On the back side of each of your strips, attach 1/4″ double sided tape across the top and bottom. Flip your 12″ x 12″ paper over. I used my fingers to gently curve the decorative strips. You can use the edge of a ruler or your bone folder. You want to give a little arc to these strips so they curl away from the main box. When you attach the strips, attach the middle strip first in the middle of the panel, just below the score line. Attach the other two strips evenly on either side. Do this on all sides. To assemble the box, attach adhesive as seen in the fourth image above. I used double sided tape so I didn’t have to wait for my glue to dry. If you have a plain paper for the base of your card, you can decorate the exposed corners. For my handle, I attached a decorative strip on both sides of my white strip. I used the small punch side of my crocodile to punch holes in each end of my handle and the sides of the box. I then used brads to attach my handle to the box. I covered the inside part of the brad with a small white flower. Now that everything is assembled, you can decorate your box. I attached a thin lace to the top and bottom of my box. I placed a satin ribbon over the top of the lace. 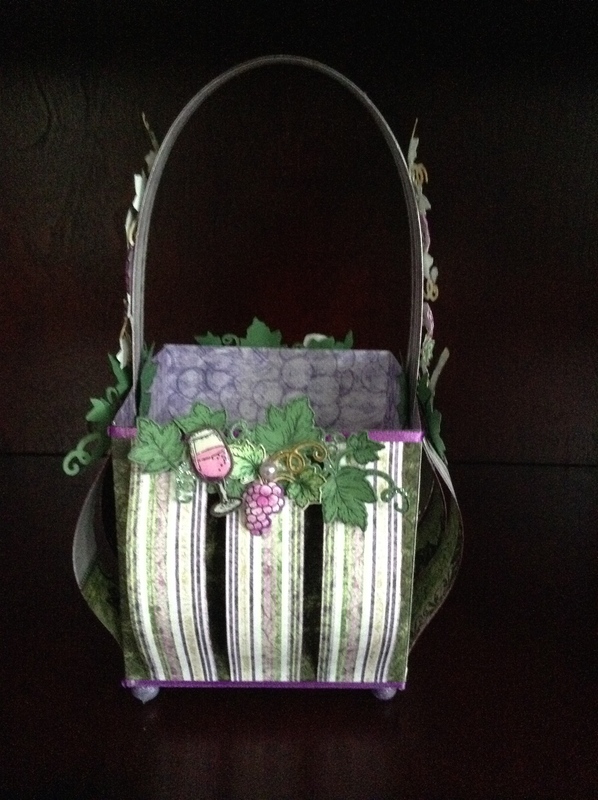 At the base of each handle, I used Ariana Blooms by Heartfelt Creations and Ariana Lace. I accented the flowers with a little bit of clear Stickles on each petal. I used the silver jewel edge Dazzle for the handle. 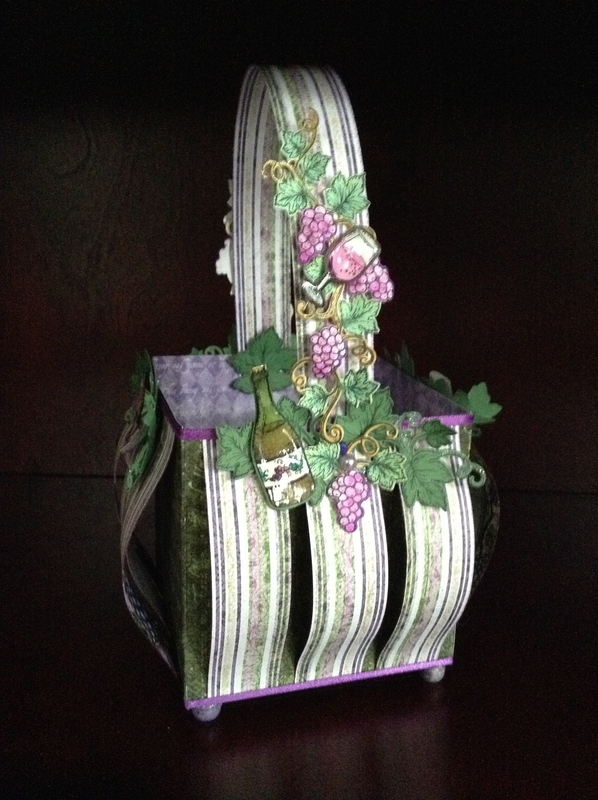 If you didn’t use a double sided paper, attach decorative 3 3/4″ x 3 3/4″ panels inside your box. For the finishing touch, I hot glued 4 large clear beads to the bottom of the box as “feet”. Try this in different colors for different occasions. 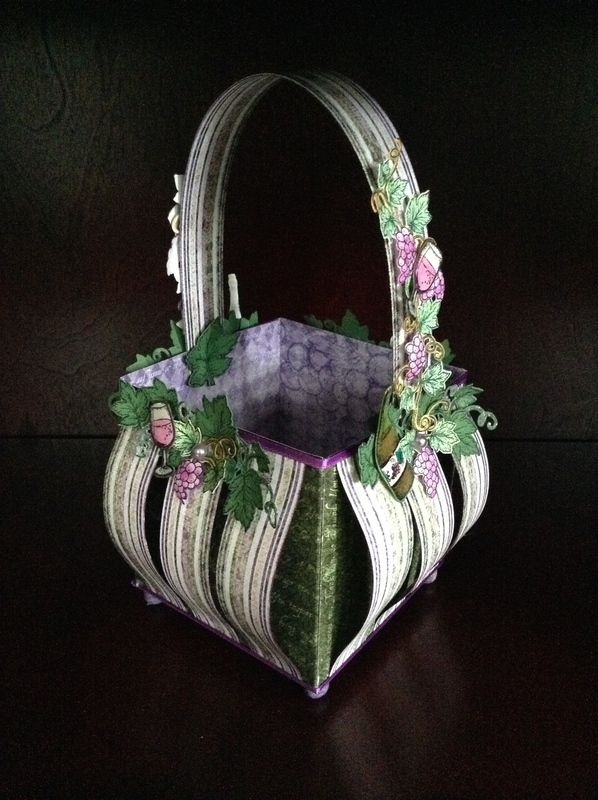 Great for Birthday gifts, Easter baskets, Christmas cookies, etc. 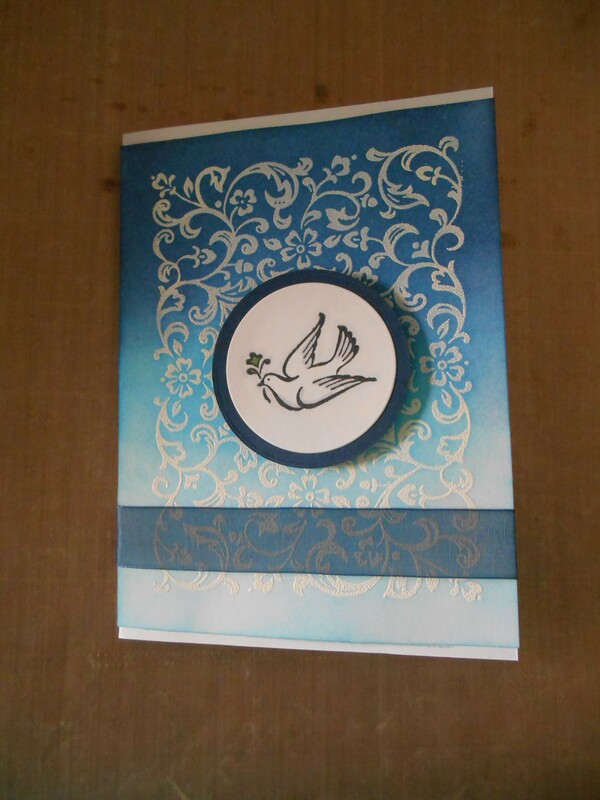 Here’s an example using Heartfelt Creations Paper, dies and stamps. 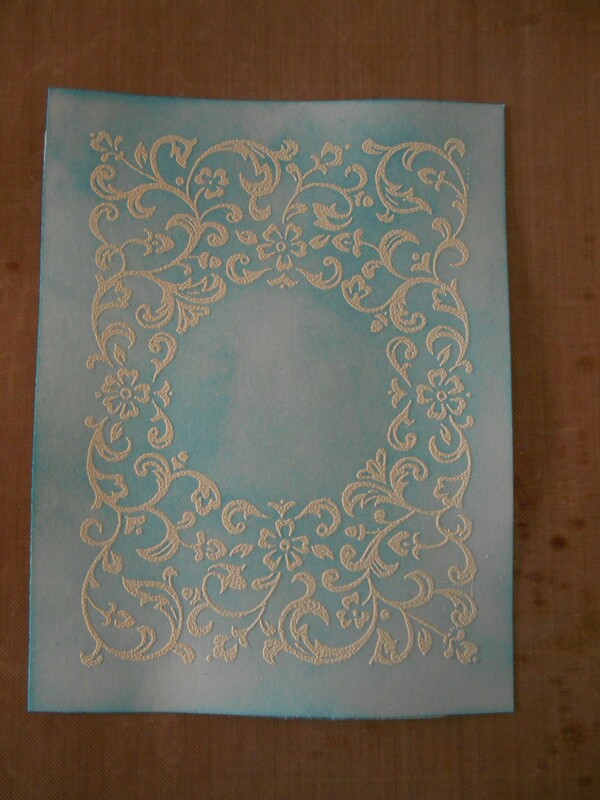 Whether you want to make a card, a tag or a scrapbook page, embossed backgrounds are fun and easy to do. I love to take a stamp set that I haven’t used in a while and use it to make an embossed background. Embossing ink and powder. 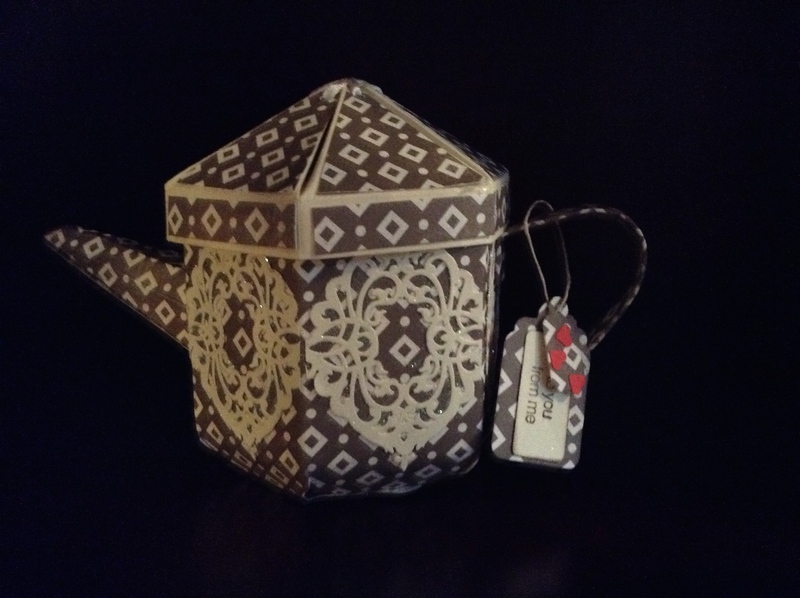 I used Versamark ink and white embossing powder. 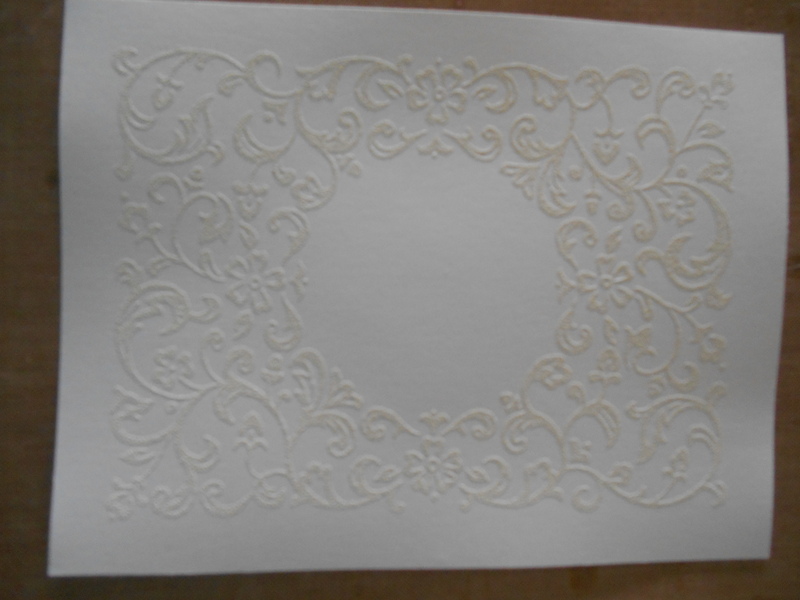 The first thing to do is stamp your image onto the white card stock, apply your embossing powder and heat set. 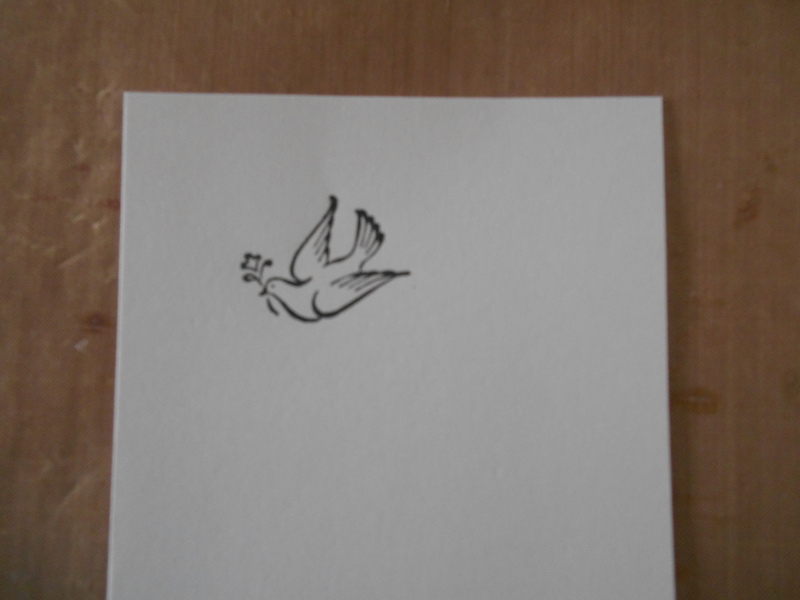 I used white embossing powder because I wanted the detail of the stamp to remain white after I inked the paper. At this time I also inked my focal image onto white card stock. I used black StazOn ink so I could color the image without the markers bleeding over the line. 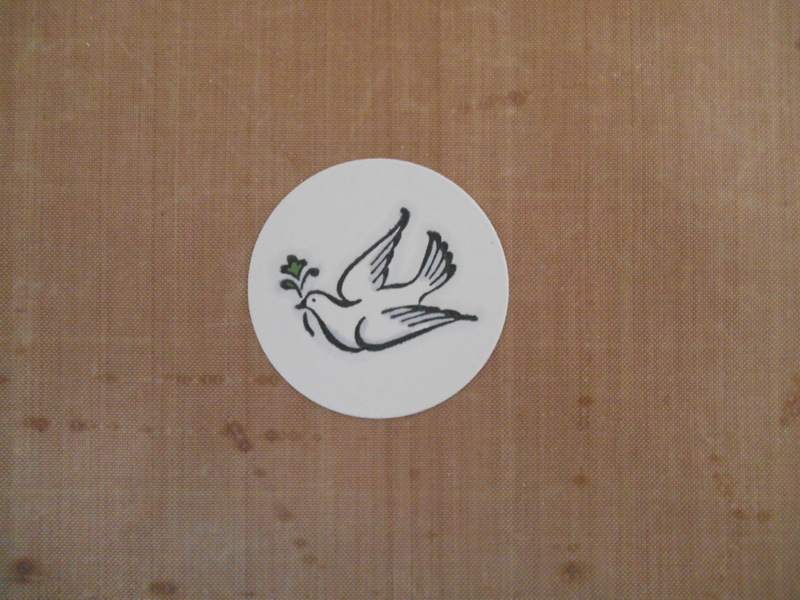 I then used a circle die cut around my focal image. I wanted my background to have a “sky” appearance so I layered my inks. For the first layer, I covered the entire paper with the Broken China using a square applicator in a circular motion. I didn’t do a thick coverage with this layer. For the second layer, I applied the Salty Ocean only to the top two thirds of the paper. Make sure you blend the area where the two colors meet and cover the area completely. For the third layer, I used the Chipped Sapphire on the top third. To really get the white details to pop, use a cloth and wipe the surface. The ink will not stick to the embossing powder. Coloring the focal image. An artist friend taught me to use a pale gray to outline the entire image before coloring. This really makes the image look clear and sharp. I used IG1 to do my outline. 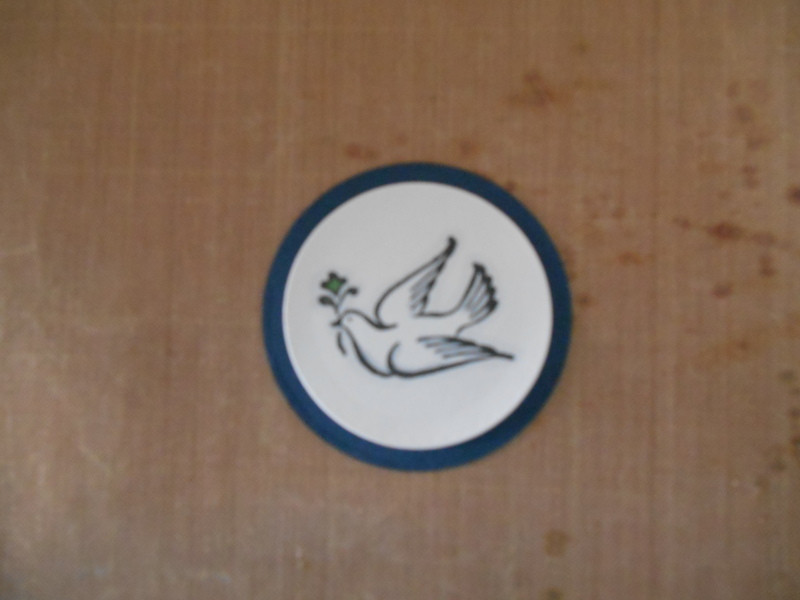 I used DG3 to color the olive branch and IG4 to accent the wings of the dove. I then mounted the image on a circle of navy card stock. 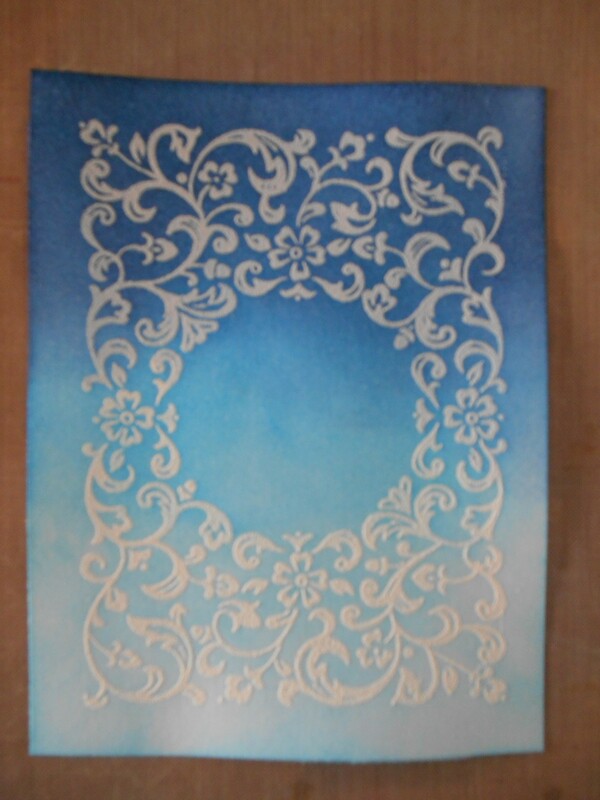 I added the navy organza ribbon to the bottom of my background before I attached it to my card base. I put a small piece of double sided tape to the back on each side and the wrapped the ribbon around the paper. 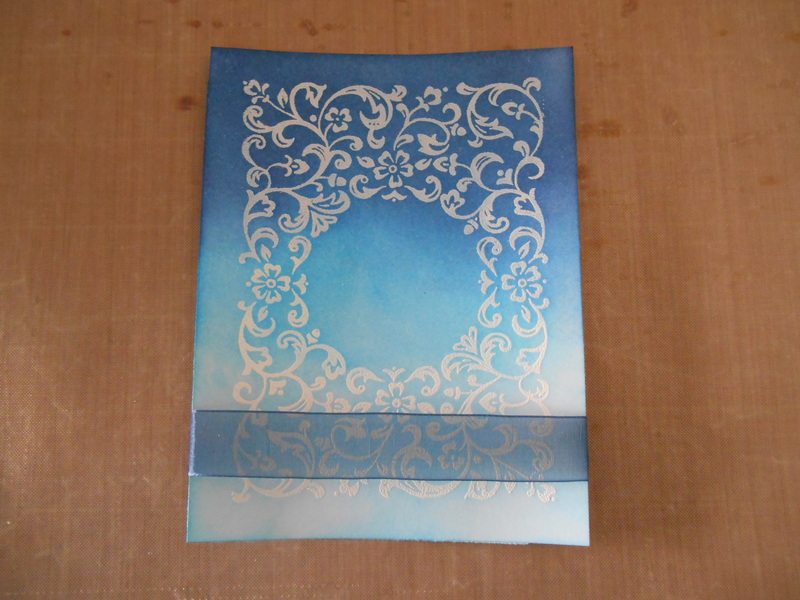 I then attached the background to the card base using my double sided tape. I used pop dots to attach the focal image to the circular area on the background. I made a double looped bow and attached it with my glue gun. I opted to only put a sentiment on the inside. 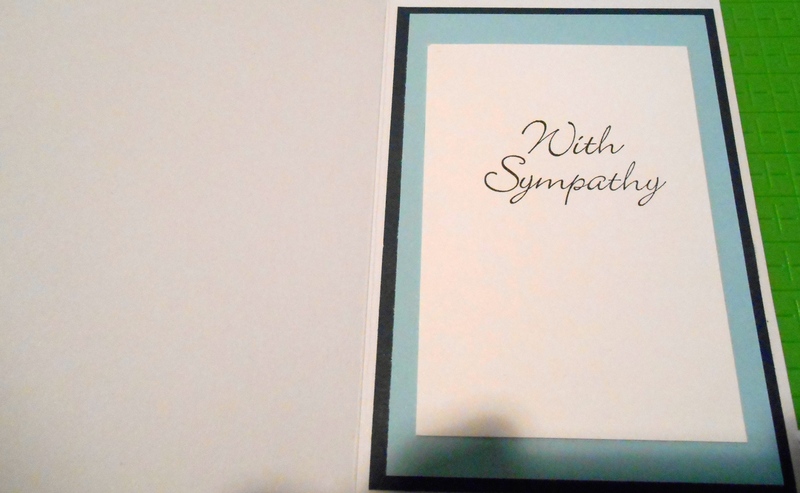 I stamped “With Sympathy” in black StazOn ink on white card stock and layered it with light blue and navy blue card stock. I hope you enjoyed this tutorial. Have a great week crafting.